The TWiVers present mitoviruses, which infect mitochondria, and how quasi-enveloped hepatitis A virus gets naked again. Become a patron of TWiV! Intro music is by Ronald Jenkees. Takamine Jōkichi funded a gift of 2000 cherry trees from the mayor of Tokyo to the city of Washington. I think it was his idea. He had the first patent on a microbial enzyme in the United States. Being Japanese, despite living in the United States for over 20 years and marrying a citizen, he could not become a citizen himself. Really cool TWiV! I’m a former Virologist who works in DNA Forensics. I always wondered if there were Mitoviruses. Or if mitochondria were evolutionarily related to viruses because mito replicate similar to some viruses (an example is parvovirus). Now I know there are mitoviruses and I have some catch up reading to do. 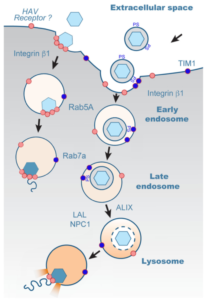 Curious if the viruses integrate into the host mitochondrial genome and alter the sequence? If they do, a mother and child might not have the same Mito genome sequence and/or a single source profile may look like a mixture and this could reck havoc on the work I do. Thanks for these great shows! Helps keep me up on one of my favorite topics Viruses. P.S. All the world’s a Phage! 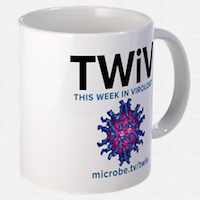 MicrobeTV is an independent podcast network for people who are interested in the sciences. Our shows are about science: viruses, microbes, parasites, evolution, urban agriculture, communication, and engineering.